More than just the lens, the FUJIFILM XF 50-140mm f/2.8 R LM OIS WR Lens with Circular Polarizer Filter Kit from B&H bundles the versatile telephoto zoom with a 72mm circular polarizer filter to protect the front element. A telephoto zoom designed for use in trying conditions, the FUJIFILM XF 50-140mm f/2.8 R LM OIS WR is a weather-sealed lens spanning the popular 76-213mm equivalent focal length range and featuring a constant f/2.8 maximum aperture. Built for FUJIFILM X-mount mirrorless digital cameras, this fast zoom further distinguishes itself with a sophisticated design, highly effective optical image stabilization system, and a Triple Linear Motor AF system for refined focusing performance. In regards to the optical design, this lens incorporates five extra-low dispersion elements and one Super ED element, which reduce chromatic aberrations and color fringing for increased clarity and color accuracy. Additionally, a Nano-GI coating has also been applied to elements to alter the refractive index between elements, to minimize surface reflections, and to prevent lens flare and ghosting. Additionally a rounded seven-blade diaphragm contributes to a pleasing bokeh quality when working with selective focus techniques. Flexible telephoto zoom is designed for APS-C-format Fujifilm X-mount mirrorless cameras and offers a 76-213mm equivalent focal length range. Constant f/2.8 maximum aperture offers consistent performance throughout the zoom range and excels when working in difficult lighting conditions. Five extra-low dispersion elements and one Super ED element are used to greatly reduce color fringing and chromatic aberrations in order to produce high clarity and color fidelity throughout the zoom range. Nano-GI (Gradient Index) coating has been applied to lens elements and alters the refractive index between the glass and air in order to better suppress lens flare and ghosting for diagonal incident light. An HT-EBC (High Transmittance Electron Beam Coating) coating has been applied to the entire surface of each element for controlling ghosting and flare for greater contrast and color accuracy. The lens body incorporates 20 distinct weather seals to protect against dust and moisture, and to enable worry-free use in inclement conditions and freezing temperatures as low as 14°F. Rounded seven-blade diaphragm contribute to a pleasing out-of-focus quality to benefit the use of selective focus and shallow depth of field techniques. Compatible with optional XF 1.4x TC WR and XF 2x TC WR teleconverters. Box Dimensions (LxWxH) 10.4 x 7.2 x 5.5"
XF 50-140mm f/2.8 R LM OIS WR Lens with Circular Polarizer Filter Kit is rated 4.6 out of 5 by 70. Rated 5 out of 5 by Dorothy from The Fuji 50-140 Is Super! When I first got an X-T1 with an 18-55mm lens, I could not afford to add the 50-140 lens. I was also concerned that its added weight would be counter to the idea of a high quality camera system that was light. But the quality of this lens is worth carrying the added weight. The focal length proved to be very appropriate for photographing intimate landscapes and gives very sharp results. Even better, the f/stop is on the outside of the lens just like in the old days, not in the view finder. Fuji has colored the f/stop blue-green on black and since I have old eyes, it is not always easy to see in either the viewfinder or on the LCD. Putting the f/stop on the lens itself makes it very easy to set. Great lens! Rated 5 out of 5 by EJ from Really Sweet Lens! I recently purchased this lens to use for short-range wildlife (e.g. shorebirds) portraits and as my all around zoom lens. I first used it on my XT-1 in tandem with my Canon 6D and the new 100-400L IS II. While some complain about the weight, in relation to the 6D/100-400L II set up, its as light as a feather the Canon rig was heavy, bulky, and unwieldy by comparison. The XT-1 with the 50-140 worked quite well, even without a grip (I've never used one). Even in low light, images were really sharp. I've walked about 10 miles on the beach with this on my shoulder and really didn't feel very heavy. Very easy to focus in all lighting conditions, quick, and tack sharp images. I would say on par with the Canon 100-400L IS II I mentioned earlier. I could not be happier with this purchase! Rated 5 out of 5 by Greg from Fabulous Image Quality One thing that I can say about this lens is that it performs. This is easily the best 70-200 equivalent lens from any manufacturer, outperforming my Canon 70-200 f/2.8 in image quality. It focuses very fast and is tack sharp even wide open throughout its entire zoom range. The only drawback I have with this lens is the lens hood, which feels cheap compared to the rest of this lens. I have not heard any of the noises other reviewers have been complaining about with theirs, maybe Fuji had a bad batch of lenses. Rated 5 out of 5 by Tom from Great lens! This lens is supper sharp!, even at f2.8 and at any zoom setting. Fiji needed something to match the Canon and Nikon 70-200mm and this does the job. It's fast focusing with my X-T1 in daylight, and is well balanced hand held. Haven't tried it in low light situations yet but so far I'm extremely happy with it. Fuji seems to be coming on strong with its pro orientated cameras and lenses. Rated 5 out of 5 by George from Excellent product that meets and exceeds my expectations I have used the Fujifilm X-trans camera system for four years, starting with the XE1 and now using the XPro2. It is my primary street and travel photography system. (I use a full frame Canon system for my landscape, nature, and other photography.) I mostly use Fuji primes, but I originally augmented them with one zoom, the 55-200mm. I recently acquired the 50-140mm f/2.8 lens in advance of extensive travel. The performance of the lens on my XPro2 is excellent exceeding my expectations in terms of AF performance and image quality. It produces excellent images at all apertures (with the expected softening at smallest apertures due to diffraction blur). I was surprise by how fast and accurate the AF is. I had read complaints about the sound the lens makes, but I do not hear anything at all unusual from mine. Rated 5 out of 5 by Mark from Spectacular lens I was used to using a Canon 70-200 2.8L, but found that I was using it less and less due to the weight. This lens is every bit its equal, but it only weighs as much as the Canon 70-200 F4! (roughly). The bokeh is wonderfully smooth (disregard the few nay-sayers who probably never owned one), and the IS is amazing. I really don't have anything bad to say about the lens. I removed the tripod foot as I never use one, and it makes it even lighter. It's still a large lens, but that's what you get when it's this well made. Highly recommended. Rated 5 out of 5 by Anonymous from A Godsend for Photographers Like Me My work increasingly takes me on tour with traveling choirs who perform in low light environments, including European cathedrals, where I need fast glass and a long lens to get the reach I need. Three recent tours with my trusted Canon gear (5D3 and trinity of f/2.8 glass) gave me great results but with considerable cost in weight and bulk. I've been moving to the Fuji X system and couldn't wait for this lens to fill that 70-200mm role. This lens does not disappoint in terms of image quality. I have shot live theater performances, professional jazz artists and choir performances side by side with my beloved Canon 70-200 and this Fuji XF 50-140. There are distinct differences in image appearance between the two. I hesitate to say image quality because that infers a better/worse comparison, which is not what I mean. The files look different, and because I find the Fuji files in general to be more malleable in terms of ability to add clarity, contrast, shadow detail and other factors, I think I prefer the Fuji files made with this lens over the Canon files. I wouldn't hesitate to recommend this lens to anyone who shoots in low light environments. It's heavy by Fuji standards, but at f/2.8 across the focal length range, you get what you pay for. Rated 5 out of 5 by Norman from JUST RIGHT I am a disabled guy and I am finding that this lens just seems to work for just a about everything from landscapes to small flowers. It even has two focus settings! Does anyone know which way the focus works on the XF lenses? Does it pull closer to the right like canon lenses or is it the opposite like Nikon, and some Sony lenses? You rotate the lens' focusing ring to the left to reduce the focus distance, and rotate the focusing ring to the right to increase the focus distance out to infinity. However, you may go into the menu and go to BUTTON/DIAL SETTING &gt; FOCUS RING to reverse the direction of rotation of the focus ring. 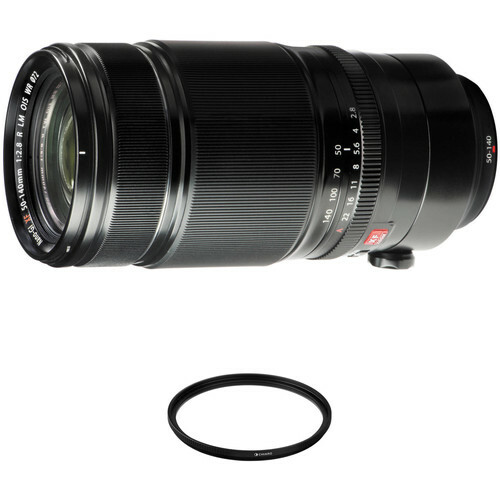 Is this lens compatible with the EX-1? does it work with gh5 directly attached or it requires to purchase an adapter for that? It's a Fujifilm XF mount lens designed for any Fujifilm X series camera. It would need an adaptor for other cameras. This lens seems to get rave reviews online but in this forum it's really getting trashed. Heavy, poor bokeh, hissing sounds, burns through batteries, etc. For virtually the same price I can get a 56 f/1.2 and a 55-200. Should I? My advise: buy Canon!Getting a Fuji system, with this lens, was a major mistake. Fuji, and probablyall of its mirrorless rivals, just aren't there yet.Re: the lens. It's useless for any kind of action shooting, eats batteries, is ofa size that destroys the goal of carrying a small, light-weight and descrete camera. I'm wandering if this lens is too heavy for my Fuji lens mount. Should I use lens collar or is the weight of the lens fine for the body? This lens has a tripod mount built in that allows for rotation. Just mount the lens to your tripod and let it hold the weight. Any advice on arca-swiss compatible lens plates that fit this lens? The mount has a 1/4-20 attachment just attach any size arca-swiss plate. I just got this lens and I'm noticing it losing focus when zooming, is this a setting I need to change in camera or is it the nature of the lens? This is normal for a still photography lens. Only very high end cinema lenses are truly parfocal (retain focus across zoom range). Any Fuji X-T10 owners using this lens? Too heavy? I purchased this lens to use with the X-T1, and have just returned from using it daily on a week long photo vacation in New England. This lens (like its 16-55mm f2.8 sibling) is significantly larger than XF series fixed focal length or travel zoom lenses. It is not unmanagable to use, but you will never forget that you're carrying it around your neck. As with the 35mm Nikon equipment that I formerly used, lens size is a factor of focal range and light gathering capability -- if you want a wider zoom range (here 76-213 in 35mm equivalent) and want or need the capability to shoot f2.8 at the 213 zoom, then this lens is it. This model also uses excellent lens glass/lens layout, offers image stabilization: a great feature for any lens. Fuji offers another zoom with a variable maximum f-stop that I presume is smaller in size and weight. If you don't need a long-range zoom lens or if you don't need the fast 2.8 maximum aperture, then there are smaller/lighter XF lens options.